The gastrointestinal tract of the piglets at parturition is sterile, but the gut microbiota develops very rapidly. The first bacteria, which become established in the digestive tract of the piglet, originate from the dam or the environment, but they are not the most abundant ones of the ecosystems encountered by the young (11). The newborn possesses very efficient selection systems enabling it to favor certain bacterial species among the bacteria of the different ecosystems. Many factors might be involved in this selection—diet, environmental conditions such as hygienic stage, temperature, the microbial interactions in the digestive tract and the barrier effect of the dominant microbiota against the environmental bacteria. The indigenous microbiota exerts a profound influence on both the morphological structure and on the digestive and absorptive capabilities of the gastrointestinal tract (12). From the stomach of suckling piglets significant populations of microorganisms have been isolated upto 107 viable counts per 1 cm2 of the tissue (13). The microbial population adhering to the pars esophagea varies little from birth until after weaning and the anaerobic microbiota, particularly lactobacilli, might be important in maintaining the pars esophagea free from colonization by other microorganisms. The stratified squamosus epithelium, of which the pars esophagea is composed, is continuously desquamating releasing cells with attached bacteria into the lumen and may serve as a continuous inoculum of specific lactic acid bacteria into the gastric contents (14). 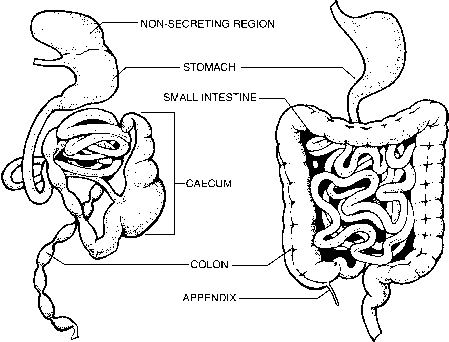 (duodenum, jejunum) whose number ranges from 103 to 107 per g content (11). This number increases progressively in the ileum, and in the last parts of the digestive tract strictly anaerobic bacteria are found among the dominant microbiota. In very young piglets, Escherichia coli is the dominant microbe of all gut segments, together with species of the genera Lactobacillus and Streptococcus. The microbiota of the piglet progressively changes with age, the number of Escherichia coli decreases in all segments and the lactobacilli and streptococci constitute the dominant microbiota of the proximal intestine. The presence of lactobacilli as a constituent of the normal microbiota of the gastrointestinal tract is considered to be beneficial to the porcine host (15). The strictly anaerobic microbiota becomes more diversified in the distal segments, where Bacteroides, Eubacterium, Peptostreptococcus and many Clostridium species are found (11). The change of the gut environment occurs in connection to weaning of the piglets. Weaning and weaning age have significant effects on microbial population and volatile fatty acids concentration (16). During the first week after weaning, pH and the content of dry matter decrease, as well as the count of lactobacilli, while the number of coliform bacteria increases (17). These changes contribute to low weight gains and predisposition to diarrhea. Associated with weaning there are marked changes to the histology and biochemistry of the small intestine, such as villous atrophy and crypt hyperplasia, which caused decreased digestive and absorptive capacity (18) and contribute to post-weaning diarrhea. The major factors implicated in the etiology of these changes are: change in nutrition, stress due to separation from mother and littermates, new environment, the withdrawal of milk-borne growth promoting factors, as well as enteropathogens and their interactions with the gut microbiota. Enterotoxigenic Escherichia coli strains are generally considered to be the main cause of diarrhea at weaning and the period immediately thereafter. The colonizing of the small intestine by enterotoxigenic E. coli strains may be possible for several reasons (19): (1) the brush border of the intestinal epithelium of newly weaned pigs may be damaged by components in the feed or by viruses allowing E. coli to adhere and colonize the damaged epithelium, (2) after weaning the pigs are no longer protected by the milk of the sow, an important factor that prevents E. coli colonization during the suckling period, (3) newly weaned pigs have a shortage of digestive enzymes and feed is poorly digested and absorbed. Concentrations of bacteria in contents of the gastrointestinal tract of pigs are much higher in the caecum and in colon than in more proximal portions of the tract. The microbiota is dominated by strict anaerobes and the most numerous species are members of the genera Bacteroides, Selenomonas, Butyrivibrio, Lactobacillus, Peptostreptococus and Eubacterium (20). The development of a complex microbiota in the large intestine takes 2-3 weeks after weaning. Starch and some oligosaccharides are mainly digested in the small intestine of monogastric animals by enzymes of the salivary glands, pancreas and intestinal brush border. Cellulose, hemicelluloses, pectins and some oligosaccharides are partly digested by the microbiota of the large intestine. Fiber total digestibility varies considerably and depends on the nature of the fiber and the animal species. It is less than 10% in chickens, whereas pigs seem to digest fibers as well as sheep (21). Dietary fiber may contribute up to 30% of the maintenance energy needs of growing pigs. Higher energy contributions may be obtained from dietary fiber fed to sows, along with some improvements in reproduction, health, and well-being. Swine microbiota constitutes highly active ruminal cellulolytic and hemicellulolytic bacterial species, which include Fibrobacter succinogenes (intestinalis), Ruminococcus albus, Ruminococcus flavefaciens, Butyrivibrio species, and Prevotella (Bacteroides) ruminicola (22). Additionally, a new highly active cellulolytic bacterium, Clostridium herbivorans, has been isolated from pig large intestine (23). The populations of these microorganisms are known to increase in response to the ingestion of diets high in plant cell wall material. The numbers of cellulolytic bacteria from adult animals are approximately 6 to 7 times greater than those found in growing pigs. None of these highly active cellulolytic bacterial species are found in the human large intestine. Thus, the pig large intestinal fermentation of fiber seems to more closely resemble that of ruminants than that of humans (22).